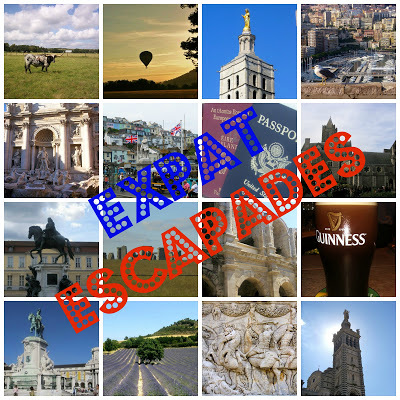 Ten days since my last (and first) round of Expat Escapades... that's not too bad at all! Let's get started, shall we. Delana du Jour made me jealous with an empty and secluded spot on the beach that's she's been able to find. Delana lives in Aix-en-Provence which isn't that far from The LPV you know, so that means (I'm guessing anyway) that this mystery beach location isn't too far away either. I'm wondering if I can tempt her to give it up, or maybe Fifty could cuddle the secret out of her. We have ways of making you talk. This post caught my eye mostly for the gorgeous factor... Jess from Love and London posted photos of her intimate wedding in New York to her new British husband. She's gorgeous, he's gorgeous, her dress is gorgeous. Click on over and O.D. on gorgeousness. When I was a kid I absolutely adored The Sound of Music. I'd watch the movie every time it popped up on telly and listened to the soundtrack repeatedly (driving everyone around me loop-di-loop) so when I saw a post about The Sound of Music Tour in Austria over on The Adventures of Holly, I was about as jealous as jealous can be. She even went to the Salzburg Marionette Theatre! High on a hill was a lonely goatherd lay ee odl lay ee odl lay hee... JEALOUS. The Young Adventuress (pretty much my favorite travel blogger) posted an Instagram catchup of her summer. Let me tell you something, this was no ordinary Instagram dump, this one has photos of England, Italy, Greece, Iceland, Switzerland... holy crackerjacks, that girl gets around (not like that... get your head out of the gutter). Take a ride on The London Eye with Selena from Oh, The Places We Will Go and watch her overcome her fear of heights. Actually, Selena did more than overcome her fear... she kicked it's booty when she took the ride not once, but twice! Gold star for you Selena. Three words... Cute. Italian. Boys. Pop on over to The Boot and see what Marissa has to say about them. And last but not least... ME! I'm guest posting over at Brachel Boulevard while Rachel and her family get settled into their new home in Spain. Click here to see what I have to say about my life in France (as if you don't get enough of that already over here) and then be sure to visit again to see how Rachel settles into her new life as an expat. the Sound of Music Tour in Salzburg was AMAZING. although I don't think we stopped by the puppet theatre...but the rest of the locations were gorgeous! A few links here have caught my eye - I do like a good wedding and I love the Sound of Music. When we visited Salzburg a few years ago I don't think they did a tour. The great thing about this series is we get to find out about blogs, who at least for me are blogs I had not come across before. Thanks for the introductions. I love this write-up (SoM fan here too) but you bet I teared up reading about Jess and her story! Glad all is well there now! Love this, especially the wedding. Please keep doing this so I can have some more reading material! Excellent round up! I just added quite a few more things on to my reading list. I love hearing what other bloggers are reading though, thanks for sharing! Thanks for sharing this, Sara! I love finding new expat blogs. I found some really great ones last time so I will check these out too! Great list! What great pictures at all of them; my traveling days are down from what they were, it is good that so many blogs take good pics; there were not a lot of pictures in this post, but you guided me to them through your suggestions - thanks!